Sod it, I’d failed to get my alarm onto vibrate and had ended up being anti-social despite all best intentions. I scrabbled for the phone, and after an age silenced the intrusive beeping. Rather embarrassed, I swept up my belongings and crept out of the dorm. The single toilet by the dorm door was predictably unpleasant after such a heavy load of visiting sleepers, but at least there was paper and the floor was reasonably dry. Stumbling out of the door, somewhat bleary eyed, I made my way back to the control to grab a towel for a shower. The volunteer I met with mentioned something about towel suppliers letting them down – so I took what he offered gratefully without complaint. In the small hours of the morning, the last thing he needed was someone moaning at him. What I returned back to the showers with could at best be described as a large dishcloth, but at least they’d been generous enough to give me three of them. The showers were at least fairly warm. It felt good to wash the sweat and grime off from the day before, get some fresh contact lenses in and clean my teeth. I was soon heading back to the control for breakfast. I passed Susan and Leslie on the way – their control skills were clearly still more efficient than mine, and they were getting ready to mount up by around 5am, just as the dawn was breaking. 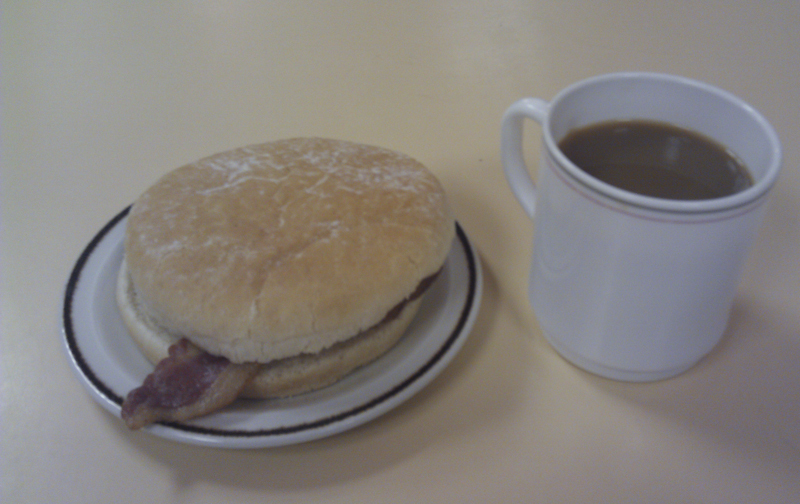 I needed sustenance before contemplating riding, and made for the canteen. A couple of bacon rolls and some sweet coffee later and I was also kitting up, and getting ready to start off again on day 2 of my LEL adventure. In my vague pre-ride plan, I’d be aiming for Moffat this evening, but a lot of riding lay ahead before. We were heading into the much hillier northern sections of the route, plus the small matter of legs which had covered my longest ever ride the day before. It was impossible to have any clear idea how far I might get. Time of departure from Pocklington: 05:30 – just after first light. Plenty of time in hand, my “control close time” for Pock was not for another four hours. It felt great to be riding through the quiet streets and out of the town in the early morning light. I’d actually planned to start my second day around dawn, and here I was doing just that. For a couple of kilometers I rode alongside a Welsh guy called Di, who was riding a fixed gear bike. I forget the exact nature of our conversation, probably something about how glorious the morning was. I do remember talking with him about choices of gearing for riding LEL on a fixed, but that was later in the morning when our paths crossed again. The road took a U shaped loop around a pretty little village called Buttercrambe. On the exit of this loop the lanes became very narrow, and strewn with potholes, gravel and mud. I was immediately glad to have ended the previous day at Pocklington. Riding these lanes at night could have been treacherous, risking a fall or damaging a wheel in some unseen hazard. Soon after the poor surfaces came to an end, I found myself at the busy A64 crossing, together with a handful of other rides. Much had been made of the danger of this crossing on the forums in the weeks leading up to the ride, but the reality ended up a lot less fearsome. The traffic was moving fast, but at this hour of the morning the gaps were more than big enough get across safely. With the A64 negotiated, a stone sign to the left of the road announced a section of the ride I had been greatly looking forward too: The Howardian Hills, an area of outstanding natural beauty (as noted on the sign). 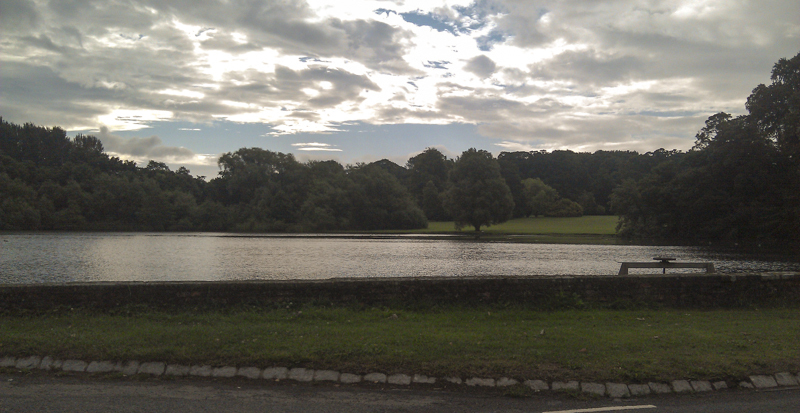 Riding through the grounds of Castle Howard in daylight was another good reason not to have pushed on the night before. I recognised the obelisk, it’s peak glinting gold at the top of a hill ahead. I knew from visiting this area with my parents that beyond the obelisk the road dipped before rising up a stunning gated drive towards the stately home. The ride through the grounds was wonderful: I noticed the garden center that I’d visited with my Mum the last time we came here; and soon after the trees opened out and to the right were the lake and lawns where Mum, Dad and I had gone to a Jools Holland concert for Mum’s 75th birthday. Prettiness and memories aside, the countryside was living up to the second part of it’s name: “hills”. The road was now a long succession of short steep uphills, followed by racing descents. Through one dip, the gradient was marked as 17% – 1 in 6 in old money. At the bottom of the descent was a treacherous bend. The mud and gravel covering made it impossible (for me at least) to safely carry enough speed through the dip to make any dent on the equally steep climb out of the other side. I really wasn’t in any mood to risk stalling out and failing to uncleat, and decided to give my legs a break and walk the short climb. To be honest, I barely took any more time to reach the top than if I’d spun up in my granny gear. I bumped into Kerri-Anne and Michael again on this stretch. It transpired they had stayed in a B&B close to here the night before, and commented on what a severe start to the morning’s ride this was. The rises and dips continued, including a delightful ride through the lovely village of Coxwold – another place I’d visited often with family. Soon after, the road started a long descent, flanked by a manor house wall and woodland to the right hand side, and open views across farmland and down into valleys on the left hand side. Based on the time, I judged we were dropping down towards Thirsk, although not being a town I really knew I didn’t recognise the scenery leading to it. At some stage, I recall catching the edge of the storm once again, the roads going from just being wet to actually riding along in light rain. By the time we joined the busy A19 for a short stretch, I was already wearing my rain jacket again. It was a relief to be turning left away from the trucks and the traffic of the busy road, and very soon after swinging onto quiet roads again, the countdown signs began again: control 3km, 2km, 1km, and there it was. Thirsk School, the first control of day 2. Early signs were promising – a volunteer was posted out front of the school with a friendly welcome as a group of us rode in. Kerri-Anne and Michael were also in the bike park as I pulled up. We all made our way in to the control. The first thing I noticed was an extremely long line for food. Having eating at Pocklington, I wasn’t desperately hungry, but I definitely fancied something to eat. Ignoring the queue for now, I turned through the doors to the right of the canteen to get my card stamped at the control. More friendly greetings and a “well done” accompanied the formalities. As lovely as all the hospitality was, the food line was still there when I returned to the canteen, only now even longer. I really didn’t fancy a long wait so early in the morning. Michael was also standing surveying the likely wait, and I commented that a tea room en route seemed a much better plan. I grabbed a coke from the machine for now, to supplement the couple of snack bars I still had left over in my jersey and bar bag, and headed back out to the bike. To save time, I rode the bike to the water tables and filled up my bottles, topping the front one off with what remained of the can of coke after a couple of quick swigs to get me going for now. Before leaving, I remembered that I hadn’t lubed my chain and the gears were still not quite indexing properly. I grabbed the dry lube and some wipes from my bag. I’d loved to have had time to clean it properly, but a quick once over would have to do. Also great would have been a mechanic or a free bike stand to trim the gears – but despite more friendly assistance, I couldn’t find either at the control. Repeating the procedure from St Ives, I manually tweaked the barrel adjuster by eye to line up with the cassette cog, rode it twice around the circle, and satisfied it was marginally better, headed out of the control. Time of departure from Thirsk: 09:07. Top marks for control efficiency, a big fat zero for leaving well fed and with bike serviced. Just to compound my lack of supplies and not eating at the control, with my concentration to navigate through the town and traffic, I immediately managed to miss the Tesco store in the middle of Thirsk. For a couple of moments I thought about turning back, but riding solo again and with no lock to secure my bike I figured that plenty of water and limited snacks was a better position to be starting the leg, than wandering around swearing because some git had nicked the bike and ended my LEL. The lanes wound, rose and fell, and my snacks soon dwindled with the exertion. First up was a pack of dried mangos, which were a delicious change from the usual snack bars, all of which were now gone. I was soon scrabbling around in my jersey for a small pack of peanuts, left over from the snacks on the way out of the Kirton control the day earlier. I made a mental note to make sure in future that at all times I had plenty to eat in my bar bag and jersey pockets. I wasn’t especially feeling like heading into a tea room, sweaty and grimy as I was, but with no shops in sight it was beginning to look like that was my only option. My dilemma was answered on an L bend through the next village. Pulled over on a small green patch to the side of the road were Susan and Leslie. They’d stopped to put sun cream on. It seemed like a very sensible idea with the storm clouds gone and sun out in full force, so I swung off the road and joined them. Also stopped with them was a fellow American rider, Vicke, on a rather splendid blue Bacchetta recumbent. We swapped stories about the amazing views that we would have missed had we ridden on from Pock, and how busy the Thirsk control had been. The girls had stopped at the Tesco that I had missed, and as soon as she heard my woes of food supplies, Susan insisted I took a snack bar from her supplies to keep me going. We rode as a group along the next section. One stretch of road near Richmond was closed, ironically it had been scheduled for resurfacing because of the ride, but the works were delayed and had yet to re-open. The upshot was that the diversion was onto an even narrower road, but still carried the same weight of traffic, making for some rather nasty incidents of trucks and cars passing close by at speed, with high hedgerows and blind bends ahead. It was rather odd to pass a blue velomobile on that stretch coming the other way. I did a double take at first, surely no one could be on their way back already. But there were no LEL signs evident on the sleek machine, so I presumed it was just someone out for a ride. I later discovered that it was in fact an LEL rider who had abandoned and was on his way back to Thirsk. Our route passed under the A1M, and the signs northward to Darlington reminded me just how far we had come over the last day and a half. I’d just begun to hear about Vicke’s former profession as a rodeo trick horseback rider, when we found ourselves alongside a training ring for horse races. We paused briefly so that the girls could get pictures of the horses training. The villages beyond all seemed to be built on the side of short steep hills, with broad swathes of green either side of the high street and babbling streams running along or across them. Bouncing along a rough stretch of road through one of these villages, I started hearing an ominous sounding rattle somewhere on the bike. At first I couldn’t trace it – there being no apparent synchronisation with my pedaling, or other movement on the bike. And then I noticed the front right mudguard stay was flapping loose. I called across to the girls that I had a minor mechanical, but was fine and they shouldn’t wait. I pulled over and rooted through the saddle bag for my multi-tool. It was hardly worth the effort, the bolt’s thread was stripped and was clearly going to be no more use at holding the stay in place. A childish grin spread over my face, and my next step was to send a gleeful message Yolandi. I was about to fix my first mechanical with a zip tie – the mark of a proper LEL rider. I might only be on day 2, but I was undertaking one of the rites of passage to becoming an official randonneur. I was cursing my packing though, the zip ties were scattered all over the place, and none of the smallest size found my hand as I groped around blindly in the bottom of the bag. In the end I made do with brute force, and simply hauled through a rather too large size with the pliers on my Leatherman. It was rather a stop for such a simple fix but I was back on my way eventually, riding solo again. Shortly after, I came upon the next treat of the day: the “wooden bridge”, made famous as an LEL landmark in Andy Allsop’s book Barring Mechanicals. For some reason, I had it in mind that this was on the way up Yad Moss, but clearly I was confused over this part of the route. I stopped to snap a couple of pictures. From here the road swung left and then right through a hairpin bend to climb sharply up from the river valley. 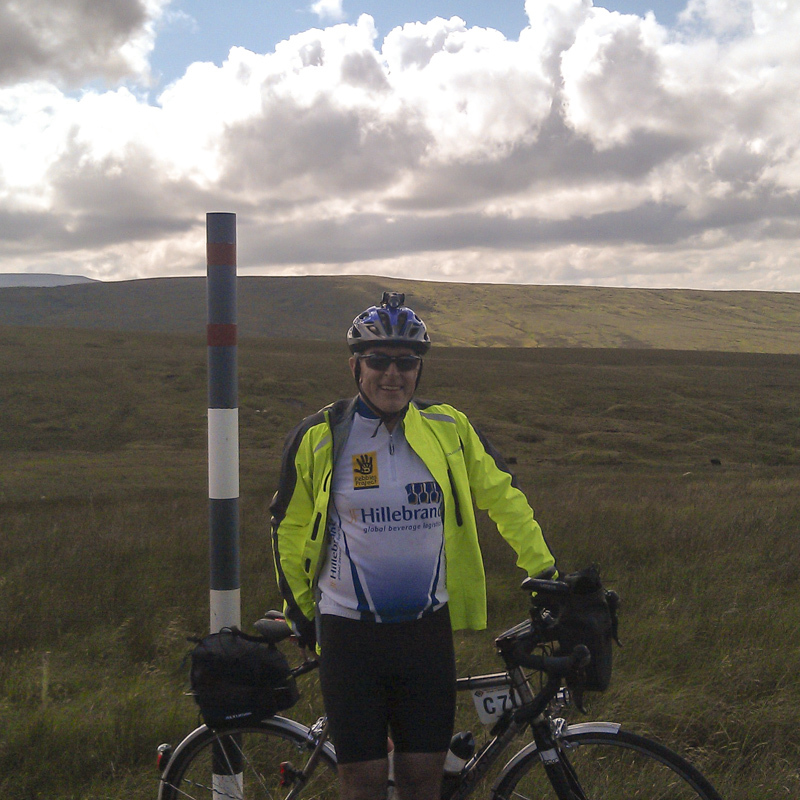 It was a steep climb that had me spinning in my lowest rings up to the little village of Whorton at the top. I was tempted to stop again and send Yoli a picture of the town sign with a “hears a who?” tag line. Shame the spelling wasn’t quite deserving of this. 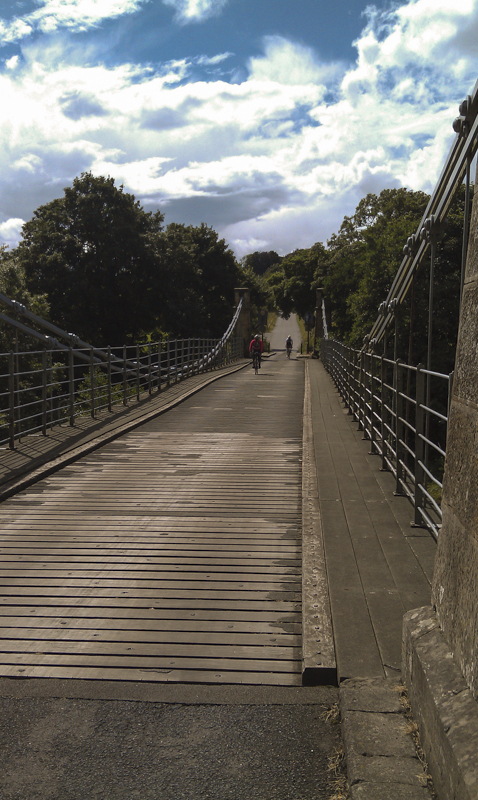 The wind on this last stretch towards Barnard Castle was a tad too harsh for weary legs, and it was a slow grind into the outskirts of the town. A grand house appeared on our right, which the sign indicated was the Bowes Musuem. I later found out that it housed an art collection. Being something of a philistine, it explained why I’d never heard of it. Barnard Castle was a picturesque and busy market town. It was something of a challenge negotiating the lunchtime traffic – I was eager to get to the control, and weaving through shoppers looking for parking places was both an unwanted and potentially hazardous delay. I’m afraid I rather missed out on the town’s loveliness in my haste to get safely to the control out of the other side of the town. Up the last short hill I was passing riders coming back the other way. Clearly the next leg, and the turn towards Yad Moss, was back behind me somewhere. For now though, that could wait, a left turn at the top of the hill brought the control and food into view. There might as well have been a McDonalds sign outside, I was starving. A day and a half in, and the routine of controls was already becoming automatic: fish out essential items from bar bag; switch off Garmin; shoes off in the entrance; get brevet card stamped at control desk; and then depending on order of needs, food and toilet. In this case, the urgency was to fill the void in my tummy. I forget exactly what I loaded onto my plate, I’m sure pasta was in there somewhere. I do remember vividly the volunteer telling me to try the rice and vegetables, “It’s delicious“. At least I think it was rice, although now I’m questioning my memory and wondering if it was couscous. Either way the volunteer was right, it was delicious, and along with the rest of the mountain on my plate it vanished faster than if you’d painted it pink and labelled it Somebody Else’s Problem. I was feeling pretty good considering the growing weight of kilometers behind me, and was eager to push on to a brace of LEL treats waiting on the next leg – Yad Moss and the cobbled main street at Alston. So for once I didn’t linger, but headed straight out, stopping by the canteen again to scout for snacks for the road. Sadly, all hints of mobile food had been picked bare, but I was told about a Co-Op shop at the BP garage on the way out. I vaguely recalled seeing it on the way in. The water taps at this control were conveniently located under cover, near to the mechanics area, making it quick and easy to fill bottles and pay a visit to get my gears adjusted for the climbs ahead. The mechanics had a long queue of repairs, but were more than happy to let me use a bike stand for a few minutes to tweak the indexing. I’m no expert in this area, but I’m handy enough to get them reasonably well adjusted using the barrel adjusters. After a few shifts up and down the rear cassette, I was comfortable the shifting on both blades was good enough to tackle some hills. A quick wipe of the chain and the job was done. As I was manouvering myself and bike out of the service area, I witnessed a simply jaw dropping act of generosity, and an enduring memory of LEL and Barnard Castle. One of the other riders had suffered a misfortune that he must have known was almost certainly ride ending: the lugs or welds of his down-tube had broken and it was swinging free, detached from the head-tube. It didn’t take a mechanic to tell there was simply no way this was going to be repairable. 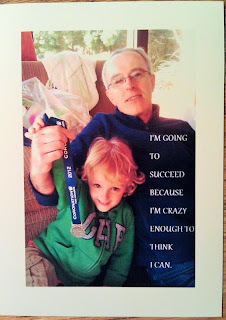 But it did take a mechanic to solve the problem – one awesome individual mechanic. With barely a hesitation, he looked the chap up and down and said “You look about the same size as me, you can borrow my bike. I can manage without for a few days, just return it to Danial when you get to Louhgton“. As if that weren’t enough, the mechanic also proceeded to transfer the rider’s seatpost, saddle and bags, using zip ties of course to secure the latter to the bike rack. After a few minutes getting the saddle height and ride position properly adjusted, the rider’s LEL was back on track. I pedaled out of the control feeling privileged to be part of an event that inspired such acts of kindness. Time of departure from Barnard Castle: 13:40. Better efficiency thanks to a much quieter control. I must be behind or ahead of everyone else, the latter seemed more likely! Sure enough, the Co-Op was by the roundabout where I had vaguely recalled seeing it. Despite casting me a faintly disapproving look, a women I took to be the manageress allowed me to prop my bike up inside against the dairy counter whilst I shopped for bottles of coke, bananas, and snack bars. The checkout girl was rather more friendly, almost laughing at the state of me – and presumably the other customers she’d served today. At least that’s how I recall it, although in reality she may have just been turning her nose up at the sight and smell of me. 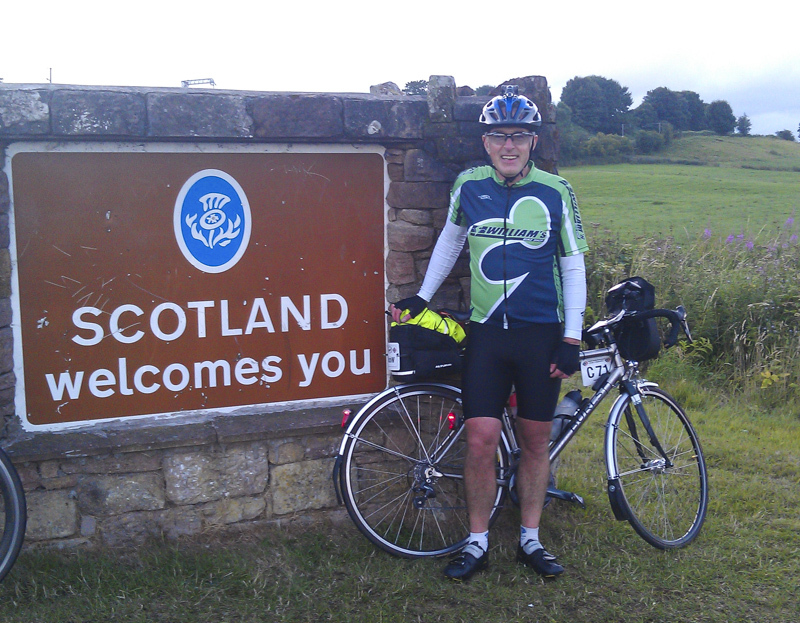 On the way out a guy nabbed me, and enquired whether I was “one of those crazy guys riding to Edinburgh“. After a brief chat containing various expressions of admiration and incredulity, he hopped into an open topped black MGB and the classic engine sputtered and roared into life. I followed him off the forecourt and started out with anticipation on the next leg. The first part of the leg was dominated with one thing – Yad Moss, another famous LEL landmark I had been looking forward too since reading Andy’s book. Each time the road pitched upward, I wondered if we were starting the climb. But each time, the road rolled downwards again, until we reached another absurdly picturesque town, Middleton-in-Teesdale. My memory jogged by the name, I recalled from the book that once we left the town we’d start out towards High Force, and the slow climb up Yad Moss proper. Despite stuffing my face at Barnard Castle, I was still hungry. I decided to stop for a snack, and sat for a few minutes on a bench enjoying the sunshine and the bustle of life in the pretty town. The black MGB pulled up as I was stuffing my face with banana, snack bar, and swigs of coke. The driver smiled and nodded to me in recognition as he was parking and I was saddling up, to tackle the highest point on the LEL ride. True to my recollection, a gradual steady climb rose up as we left the town, with the Garmin reading 20Km to the next marker. At this point, I should say mention that there was one distance indicator I hadn’t bothered to disable, which was “Distance to Next“, showing top right on the map display. Since these were largely random points on each leg and not specific Waypoints I had created, it didn’t really affect my use of time to judge the next control. I never really knew what “Next” was at any given time, and so it remained irrelevant to me. This measurement had me intrigued – it was a long way off. It was too close to be the end of the stage, was it the distance to Alston perhaps? That also seemed unlikely. Surely it couldn’t be the distance to the top of Yad Moss – all of the climbs back home were shorter than this, and most climbed considerably higher than the 598m we were aiming at. Franschhoek pass must be almost double that, and the climb is only around 7Km. The road was initially tree lined, the River Tees falling away into the valley on our left as we climbed through a succession of hamlets: Newbiggin; High Force, so named because of an impressive waterfall; Langdon Beck and finally Harwood. 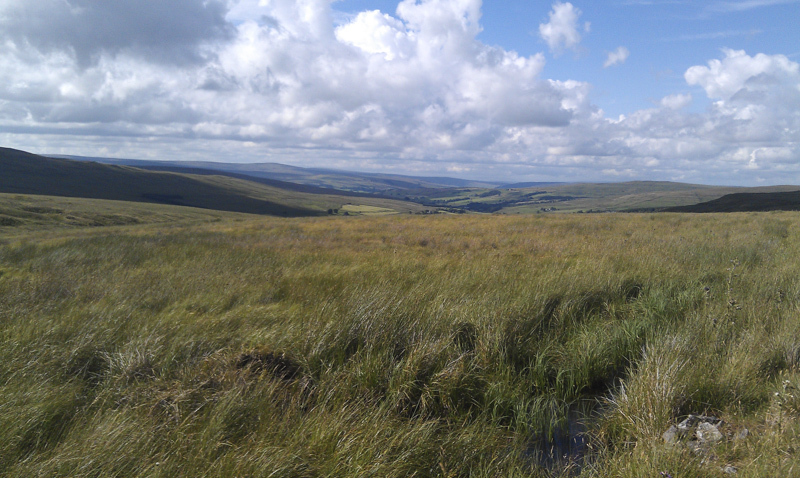 At some stage, I think after Langdon Beck, we left the trees behind and rode up onto a stunningly serene and vast expanse of open moorland. We soon passed a very well known sight – the whitewashed barn – which had been photographed and posted on the LEL Facebook page. It suddenly felt strange to actually be here, riding past something that only weeks before I had been looking at and commenting on pictures of. Sheep grazed on the open moor, occasionally darting across the road, sometimes frighteningly close to other riders. The roadside also held a grim indication that not all motorists took heed of the large red Slow Down signposts, as we passed numerous ovine carcasses in varying states of decay along this scenic stretch of road. The road was never steep, but the climb was almost continual. I was just beginning to work out that the Next marker must actually be the peak of the climb, when I spied the familiar bikes and orange jackets of Susan and Leslie up ahead. I forget whether I caught up with Vicke before or after that, but over the next few hundred meters we all came together as a group again. With our different climbing speeds, we each made our own way to the top of the moor, but were never more than a few hundred meters apart during the rest of the climb. Rather disappointingly, there was no sign or cairn marking the actual top, so we picked the closest marker pole to Next reading 0m, and declared our own summit. 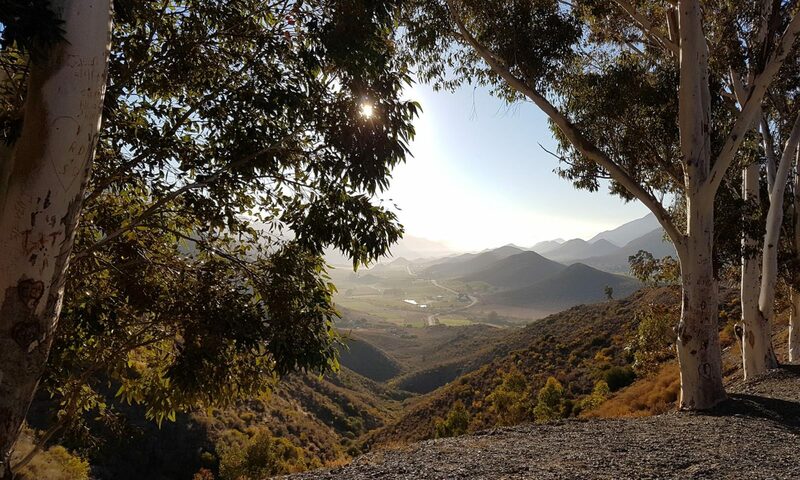 We had crested Yad Moss, and both the climb and views had totally lived up to expectations. Despite a fresh breeze, we’d also only had a brief if fairly heavy rain shower to contend with. As I took out my phone for photographs and to message Yoli, I noticed a worrying sight. The phone battery was very low, and the buffer battery had just a single light blinking indicating a very low state of charge. I’d already noticed the phone was getting low back in Barnard Castle, and had dispensed with running Endomondo. Clearly that had not been enough, and I was still losing charge faster than the dynamo was replacing it. I spun the wheel a few times to check the buffer battery lights showed it was charging – they did, but clearly the amount going in was not enough. This didn’t make sense – it had all worked perfectly on preparation rides. The only cause I could think of was that the buffer battery had failed. Whatever the cause, at this rate I’d be unlikely to have enough charge left for a call home that evening. I looked at the long downhill to Alston. It occurred to me that it could well be long enough to charge the phone if I fed it direct from the eWerk voltage converter. The USB voltage was the same as the buffer battery, but I knew from forum accounts that phones did not like the stop/start charging direct from the converter. There was a significant chance I might fry my phone battery. I made a snap decision, the phone was old and I’d been planning replacing it. The risk was worth it for a call home. I sent Yoli a message warning her I might be about to destroy my phone, but would call home if my emergency hack worked. 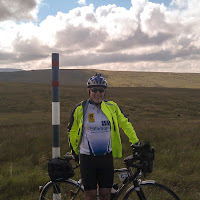 The buffer battery now removed from the circuit, the bike and I picked up speed as we descended towards Alston. I forget exactly where our group split up again. I was a much slower descender than the girls, and remember saying I’d keep going as they would be bound to catch up with me again. I’d guess they stayed for more photographs or some-such. The run down towards Alston must have been around 15km of wonderful free-wheeling, a perfectly timed break after the climb up. At the entrance to Alston, a sign indicated 14% gradient. Initially this was on tarmac, and then through the centre of the old town it ran onto the famous cobbles. Luckily, my tyre pressures were not especially high, but even so it was jarring on tired elbows. I should probably have been braver and sped through, instead I picked my way down gingerly. In hindsight, I should probably have ridden on the pavement, or better still stopped and joined the other riders sitting under the Market Cross in the middle of the town enjoying ice cream. I didn’t stop though, I rode on. And although I missed out on ice cream, the upside was that I did manage to get that call home. Shortly after the right turn towards Brampton, I pulled to the side of the road and was delighted to see the phone had indeed picked up charge nicely. It was great to hear Yoli’s voice, and chat to Ben before bedtime and wish him a good night. There was a telecom engineer parked close to where I had stopped, and once again I had the now familiar “where are you guys going” conversation before setting off again. Aside from a couple of short climbs immediately after Alston, and a short uphill stretch towards the end, the road to Brampton continued to be predominantly downhill, and fast. It wasn’t just fast for those of us riding LEL. It was frighteningly fast for the drivers also using the lane, presumably going home after work judging by the hour. I lost count of the number of times a car flashed past at speeds well above the limit, and braked hard as they came up on a bunch of riders ahead, sometimes passing them on a blind bend without even slowing. I was certain we were going to witness an accident, or worse be involved in one. I thought of Yoli, and Ben, and for the first time since the start the risks of the ride occurred to me and I wondered if they were worth it. As if to confirm my fears, around the next corner was a broken down stone wall festooned in accident tape, with a car on it’s roof deep down in the stream bed beyond. Despite the glorious weather and sublime scenery, I wanted this section to be over, safely, soon. Fortunately, our riding speed was such that rush hour ended well before we reached the control, and we had a peaceful road to ourselves again as we climbed up and over the last small climb before Brampton. In one long downhill rush, I was at the control, just in time for dinner. As well as cycling and scenery, food was starting to dominate my LEL. Parking the bike, I began to wonder about my provisional target for the day at Moffat. Time wise it certainly seemed possible, but I was now rather tired after the hills and really had no idea how tough the riding over the next leg would be. I quizzed the control volunteer who stamped my brevet card, and the canteen volunteers about the terrain to come. Reasonably flat, fast, and not that interesting seemed to be the consensus. That sounded like an almost perfect combination for riding at night, and I resolved to push on after sustenance and a visit to rummage my “northern” drop bag for supplies and treats. I simply have no clue what I ate at the control – but I am certain at least some part of it involved pasta. I think the pudding part may have been a chocolate muffin. Whatever it was, it was definitely covered in custard. And, with the next stage being a night time one, I would definitely have enjoyed at least two cups of hot, sweet, coffee. I’m also pretty certain I sat there sated for a few minutes, whilst the food and caffeine worked their way into my system, replacing some of the reserves used climbing over The Pennines. Leaving the canteen, I visited the vending machine for coke, and a magnificent array of bananas and snacks, many of which got stuffed into my jersey pockets. With my desire to get to Moffat and actually sleep, and my new found interest in control efficiency, I wasted no time on niceties with the drop bag. It’s contents were disgorged onto the tarmac next to my bike, and rapidly picked over. The partially depleted Lezyne light battery from the night before was replaced, a clean shirt went on, and clean shorts went into my saddle bag for later. The dirty shirt and the shorts from yesterday went back in the drop bag, sealed into a plastic bag to protect the remaining contents from their rather special odour. Coming rather too close to a strong whiff of Camembert, I realised the socks I was wearing also belonged in the plastic bag, and a fresh pair went on. Saving the best until last, the final order of business was the envelope marked Drop Bag 2 – another wonderful treat reminding me of my support back home. After returning the drop bag, and filling water bottles (once again one with half coke to keep the night time noddies at bay), I struck out towards Scotland. Time of departure from Brampton: 19:15. Not too bad at all really. The volunteers hadn’t misled me. The stretch from Brampton to Longtown was largely flat, straight and fast. It wasn’t the most scenic stretch we had ridden by a long way, but it was pleasant and the riding was easy, aside from a couple of close encounters with yet more lunatics in cars. I considered pulling over to the parked police car I was passing to inquire if they wouldn’t mind finishing up their donuts and, I don’t know, maybe doing something crazy like apprehending speeding motorists and saving a few lives. I decided they might not take the suggestion with the humour it was intended, and so rode on, leaving them to enjoy their peaceful evening picnic. We joined the A7 briefly to wind through Longtown, and cross the River Esk. I knew from childhood holidays that we were now deep into border country, the Esk rising high on Scottish moors that we would be traversing tomorrow on our return southbound. Sure enough, as we exited the town a road sign to Gretna Green confirmed my instincts – there were no more towns between us and the border. Sure enough a few kilometers later, a large stone post announced our entry into Scotland. 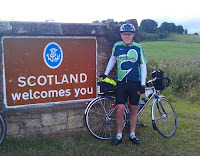 It suddenly felt an immense achievement – just yesterday morning I had ridden out from London, and here I was riding into Scotland in the last rays of daylight. On childhood holidays, my father would take two or three days to drive this far. I guess his reason for taking the journey slowly had more to do with the pain of driving long distance with alternately bored, hyperactive, or vomiting kids on the back seat. I couldn’t resist stopping for an obligatory photograph, along with pretty much every LEL rider who passed. In my case, it seemed quite apt that Vicke, having just finished having her photo taken, returned the favour and took mine. Riding off, she commented it was my turn now to photograph the next riders through. I also couldn’t resist a message home with the photo, followed by a call. I was feeling on top of the world and going great, and I wanted Yoli to know that so she’d sleep well and not worry about my progress or spirits. I also asked her to post the photo and share it to William – it seemed appropriate I’d reach this milestone in his bike shop jersey. Not far down the road I caught up with Vicke again, and explained to her the significance of Gretna Green – a border town made famous for runaway marriages in the days when parental permission for marriage was required under the age of 21, and was far from a certainty. We rode together for a while as evening turned to dusk. We chatted about the vagaries of different Garmin models, the change or architecture since the border, recumbents, and I’m sure a range of other subjects. A significant topic of our conversation though was a fairly severe pain which was starting to spread through my shoulders and neck. Vicke commented that neck injury and pain was something she had battled, and which had prompted her switch to riding a ‘bent. She also suggested I avoid staying static in one position too long, and make an effort to turn and look left and right even though at night time there was no real scenery to look at. As the pain grew, I asked if she minded if I pushed on. My gentlemanly instincts told me I ought to ride along with her, but common sense dictated that with strong legs and a failing neck, I should use the former to power me through this leg and get to the control quickly to lessen the strain on the latter. Vicke was fine with that, and I charged ahead. Although the road occasionally rolled gently upwards, it was mostly flat, and I raced on – pushing my speed harder than I had at any stage of the ride so far. It occurred to me that my legs may complain about the exertion at some point ahead, but for now they obeyed, and the caffeine and adrenaline powered me onwards. The town of Lockerbie came and went. I can still remember the news footage of the downed Pan Am flight 103. The images seemed totally at odds to the serenity of the peaceful town I was passing through in the dark of the night. Our route followed the path of the A74(M) for the rest of the leg to Moffat, crossing over the busy road repeatedly along the way. I guessed that the road we were on had been the original road before the multi-lane motorway had been built. It had all the hallmarks of being a former main road – wide and largely straight, and a road surface no longer receiving the same level of attention it’s stature appeared to deserve. In a few places, it was worse than Alston’s cobble stones. At the speed I was now traveling, I had to alternate between looking down the road for bends and other distant hazards, and looking directly in front of my wheels for potholes. At times I rode directly on the white line at the edge of the road, it being the smoothest part. I had the sensation of being a lone time trial rider, blasting my way towards the finish against the clock. It was exhilarating, and nicely diverted attention from the pain in my neck. I seemed to alternate position with a couple of groups of riders. At times they were ahead of me, at other times I passed them again. Night time riding does funny things to your concentration, and speeds tend to wander in a way they wouldn’t during the day with a speedo readout in front of you. Rather surprisingly, just outside Moffat I caught up with Susan and Leslie again. Vicke and I had commented we didn’t expect to see them again today, and I hoped it didn’t mean they’d had a mechanical. It transpired they hadn’t, just a stop in one of the towns we had passed. We rode on together through the town of Moffat and into the control. Over the past two days, I had covered more than double any previous training ride, and tomorrow morning I’d be in Edinburgh. I was stoked with my progress. Even with a few aches and the shoulder and neck pain acquired on the leg just completed, I’d hardly had a low point all ride. For such a mammoth challenge, it was going rather well. I wheeled into the bike park with an immense sense of satisfaction. No sooner inside than I almost lost my shoes – a near disastrous outcome with more than half the ride ahead. I’d handed them to a volunteer, in the bizarre notion he would remember me and the shoes amidst the hundreds of others. And needless to say, on returning from having my brevet card stamped, I was confronted with a blank stare. What had I been thinking? Luckily, he did remember the last few pairs of shoes he had found niches for, and one of them was mine. I put the numbered ticket handed to me at the control in them – a remarkably ordered system compared to the “dump them somewhere vaguely memorable” approach from previous controls. After my third or fourth hot meal of the day (I forget exactly how many), I approached the dormitory in the hope that this time there would be space. There was, and after noting down my wakeup time, I was squeaking and shuffling myself comfortable on the blow up mattress. Half a meter to three sides of me were the prostrate carcasses of fellow riders, and their cacophonous snoring and farting. I wondered how an earth I’d get to sleep. I also couldn’t get comfortable initially, until I noticed that pretty much every other body was lying straight out. As someone who normally sleeps curled on their side, this did not seem especially likely to be successful, but the relief was almost immediate. Apparently after two days hunched over a handlebar, the chance to stretch out overrides any concept of normal sleeping posture. I was asleep in moments, presumably adding my snores and farts to the chorus around me.